I have studied plant oils for skincare for many years and love to learn in depth why they are so good for our skin and particularly good for certain type of skin. What plant oils are made of to be essential for skincare? How do they work to heal any skin condition ? and what is the correct way to use it to get all benefits? On the other hand I love discovering and supporting local businesses , therefore when I find a really good product/ingredient to use in my skincare workshops that I can get at my doorstep I quickly recommend to my students, ingredients easy to get in your local supermarket makes your skincare making craft much easier and inexpensive. I happen to be in the Freefrom Festival in RDS in Dublin few years ago and met Jack the founder of Newgrange Gold who was offering tester of the Irish grown Camelina oil with a little piece of bread. I never came across this oil before but I became very interested when Jack was explaining about its high content of Omega 3 and Vitamin E. Wow these are very important for skin health. I have shared few tips and recipes on how to use this oil on your skin at the end of this post but before I would like to explain what make this oil to be a high performance beauty oil. So lets see WHAT is Camelina oil and WHY it is a great deal for our skin . 10% Tocopherols (Vitamin E) great antioxidant to protect the oil itself from free radicals avoiding rancidity and for the same reason GREAT to protect the skin cells from oxidation = aging. Shelf-life 2 years aprox. which is very good when you are creating a skincare product that will last a reasonable period of time. Even though you can always add 0.5 % Tocopherol (vitamin E) I do this when buying oils with short shelf life . Camelina has excellent emollient, anti-inflamatory , hydrating, and moisturising properties . Exactly what the skin needs . Your Irish beauty oil at your doorstep. Excellent in anti-wrinkle/skin rejuvenation products. Excellent emollient with an amazing good skin penetration which means it is non-oily feeling and it is absorbed pretty quickly. Improves skin’s elasticity and gives a glossy finish to the skin without the oiliness factor. This type of oil is called in natural beauty: dry oil, thin and short oil. Especially beneficial in products to treat mature and/or dry skin. Very effective in treating skin conditions such as acne, eczema and psoriasis. Reduce the size of pores therefore it is very good for large-pored and/or oily skin. It has similar properties to Rosehip oil (one of my favorite high performance beauty oils ever) with the difference that Camelina can not be used on sensitive skin due to 1-3 % erucic acid which is a potential dermal irritant. 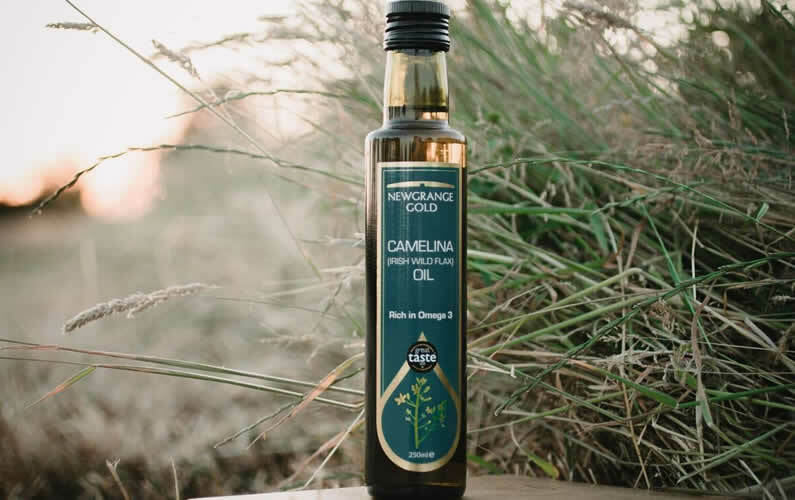 Camelina oil is a very affordable oil €4.49 for 250 ml size bottle. Best to blend with other soft oils as applying Camelina oil on the skin feels rough. It blends well with Jojoba oil, Macadamia oil, undiluted Vitamin E, Castor oil, Evening Primrose oil and Sweet Almond oil. Warning: Best not used during pregnancy or on sensitive skin. Percentage of use of Camelina oil in skincare products varies between 10% to 75% depending which type skincare product you are making and whether it is for body or face. You can always add many other ingredients to this serums: vitamins, flower extracts, essential oils, CO2 extracts, but you need to follow percentages and solubility to create a more advanced skincare product . Apply 1-2 drops of this serum on clean skin and AFTER your moisturizer as it is an oil based serum. When you make big batch of any skincare product it is recommend adding Tocopherol (Vitamin E) a minimum of 0.5% and if you use superior quantities of Tocopherol you must add Rosemary Antioxidant (CO2 extract) as well. You can include Camelina oil in so many skincare formulas such as: serums, face lotion, creams, body creams, body oils, bath oils, massage oils, face exfoliating , body scrub, balms , salves and ointments. Basically in any oil based and emulsion/creams products. Click here for full article written by Mayca Fernandez, Natural & Organic Skincare Educator on using camelina oil in your skincare routine.